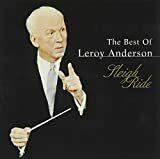 Leroy Anderson ( lə-ROY); June 29, 1908 – May 18, 1975) was an American composer of short, light concert pieces, many of which were introduced by the Boston Pops Orchestra under the direction of Arthur Fiedler. John Williams described him as "one of the great American masters of light orchestral music." Shall I Take My Heart and Go?